TAIZ, Yemen — Day after day Nabil al-Hakimi, a humanitarian official in Taiz, one of Yemen's largest cities, went to work feeling he had a "mountain" on his shoulders. Billions of dollars in food and other foreign aid was coming into his war-ravaged homeland, but millions of Yemenis were still living a step away from famine. 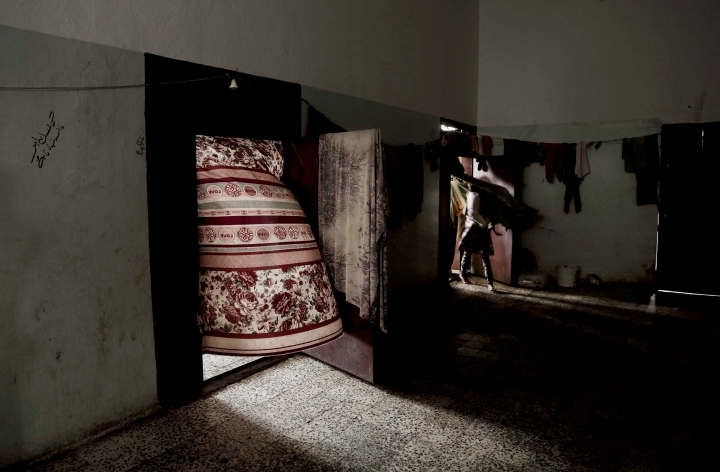 Reports of organizational disarray and out-and-out thievery streamed in to him this spring and summer from around Taiz — 5,000 sacks of rice doled out without record of where they'd gone . . . 705 food baskets looted from a welfare agency's warehouses . . . 110 sacks of grain pillaged from trucks trying to make their way through the craggy northern highlands overlooking the city. Food donations, it was clear, were being snatched from the starving. 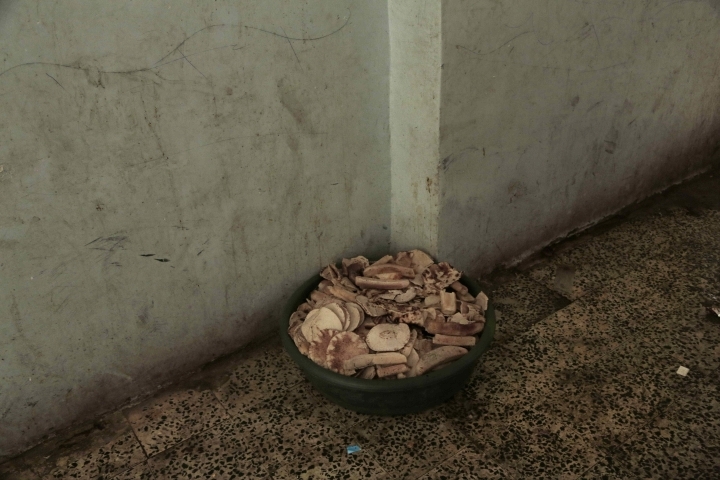 Documents reviewed by The Associated Press and interviews with al-Hakimi and other officials and aid workers show that thousands of families in Taiz are not getting international food aid intended for them — often because it has been seized by armed units that are allied with the Saudi-led, American-backed military coalition fighting in Yemen. 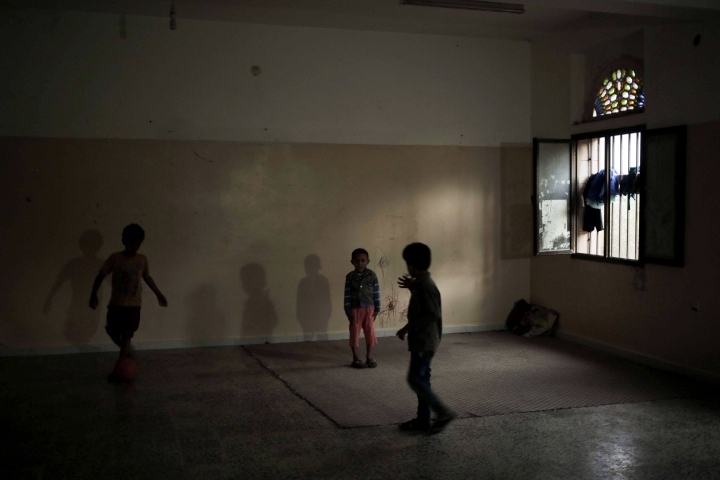 "The army that should protect the aid is looting the aid," al-Hakimi told the AP. 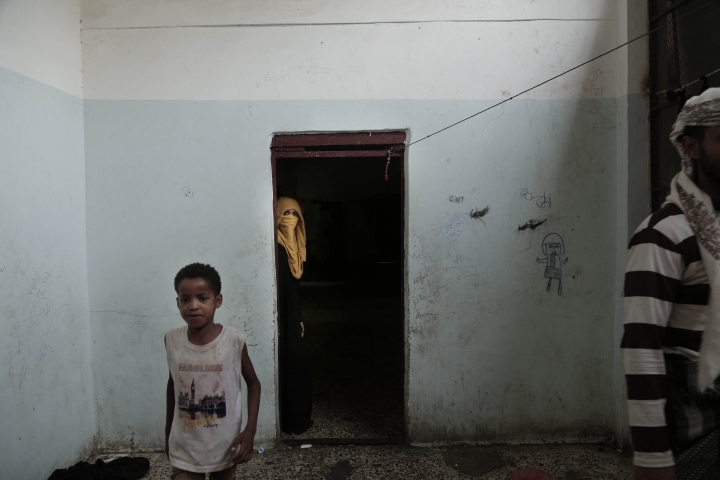 Across Yemen, factions and militias on all sides of the conflict have blocked food aid from going to groups suspected of disloyalty, diverted it to front-line combat units or sold it for profit on the black market, according to public records and confidential documents obtained by the AP and interviews with more than 70 aid workers, government officials and average citizens from six different provinces. 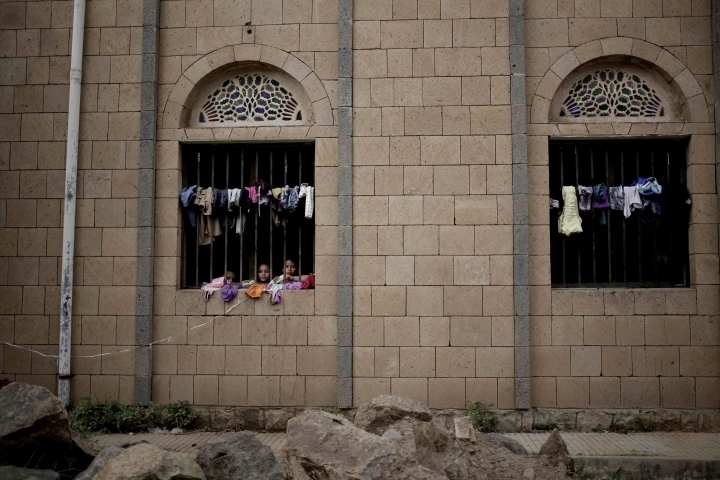 The problem of lost and stolen aid is common in Taiz and other areas controlled by Yemen's internationally recognized government, which is supported by the Saudi-led military coalition. It is even more widespread in territories controlled by the Houthi rebels, the struggling government's main enemy during the nearly four years of warfare that has spawned the world's worst humanitarian crisis. Some observers have attributed the near-famine conditions in much of the country to the coalition's blockade of ports that supply Houthi-controlled areas. 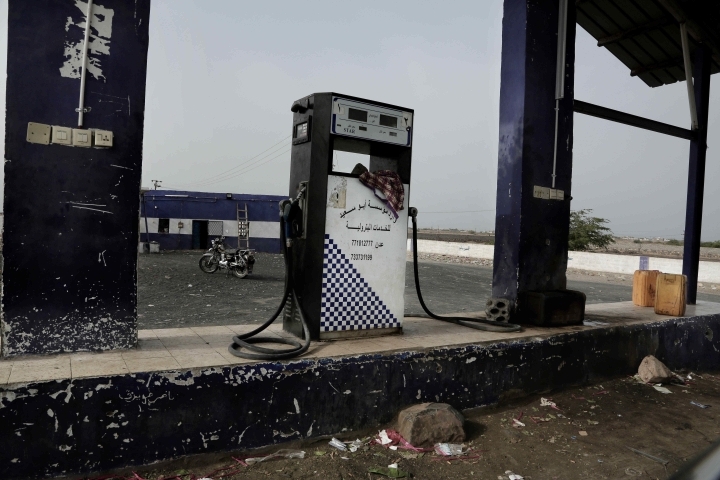 AP's investigation found that large amounts of food are making it into the country, but once there, the food often isn't getting to people who need it most — raising questions about the ability of United Nations agencies and other big aid organizations to operate effectively in Yemen. After the release of the AP's investigation on Monday, the United Nations' World Food Program for the first time directly accused the Houthi rebels of diverting aid. WFP director David Beasley said in a letter to the Houthis' leader that if the rebels did not investigate and put an end to theft, the organization would suspend some assistance, potentially effecting nearly 3 million people. "These incidents of fraud amount to stealing food from the mouths of hungry Yemeni children," Beasley wrote. The WFP said its own investigation had found "evidence of trucks illicitly removing food from designated food distribution centers" in Houthi-controlled areas as well as fraud by a local food aid distributor connected to the Houthis' Education Ministry. It said it learned many people in the Houthi-controlled capital, Sanaa, have not been getting food rations they're entitled to and that in other areas "hungry people have been denied full rations." The World Food Program has 5,000 distribution sites across the country targeting 10 million people a month with food baskets but says it can monitor just 20 percent of the deliveries. This year the U.N., the United States, Saudi Arabia and others have poured more than $4 billion in food, shelter, medical and other aid into Yemen. That figure has been growing and is expected to keep climbing in 2019. Despite the surge in help, hunger — and, in some pockets of the country, famine-level starvation — have continued to grow. An analysis this month by a coalition of global relief groups found that even with the food aid that is coming in, more than half of the population is not getting enough to eat — 15.9 million of Yemen's 29 million people. They include 10.8 million who are in an "emergency" phase of food insecurity, roughly 5 million who are in a deeper "crisis" phase and 63,500 who are facing "catastrophe," a synonym for famine. Counting the number of people who have starved to death in Yemen is difficult, because of the challenges of getting into areas shaken by violence and because starving people often officially die from diseases that prey on their weakened conditions. The nonprofit group Save the Children estimates that 85,000 children under the age of 5 have died from starvation or disease since the start of the war. In some parts of the country, fighting, roadblocks and bureaucratic obstacles have reduced the amount of aid getting in. In other areas, aid gets in but still doesn't get to the hungriest families. In the northern province of Saada, a Houthi stronghold, international aid groups estimate that 445,000 people need food assistance. Some months the U.N. has sent enough food to feed twice that many people. Yet the latest figures from the U.N. and other relief organizations show that 65 percent of residents are facing severe food shortages, including at least 7,000 people who are in pockets of outright famine. Three officials with the coalition-backed government told the AP that they would provide replies to questions about the theft of food aid, but then didn't provide answers. Officials at the agency that oversees aid work in Houthi territory — the National Authority for the Management and Coordination of Humanitarian Affairs — did not return repeated phone calls from the AP. U.N. officials have generally been cautious in public statements about the Houthis, based in part on worries that the rebels might respond by blocking U.N. agencies from access to starving people. 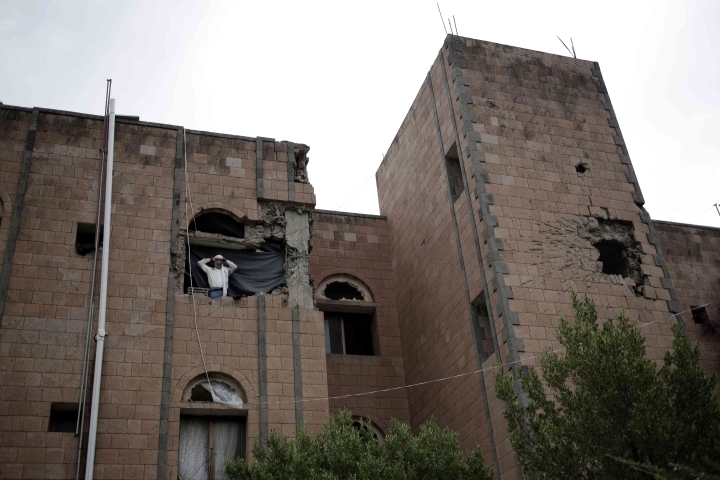 But in interviews with the AP, two top U.N. relief officials used strong language in reference to both the Houthis and their battlefield adversaries. 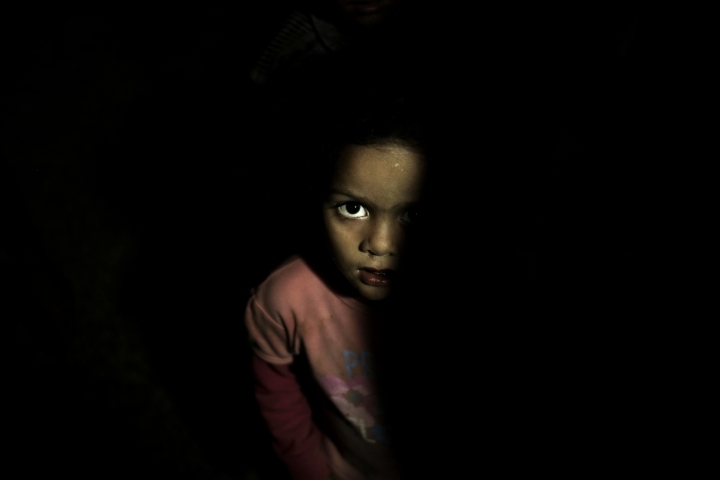 Geert Cappelaere, Middle East director for UNICEF, the U.N.'s emergency fund for children, said authorities on "all sides" of the conflict are impeding aid groups — and increasing the risk that the country will descend into widespread famine. "This has nothing to do with nature," Cappelaere told the AP. "There is no drought here in Yemen. All of this is man-made. All of this has to do with poor political leadership which doesn't put the people's interest at the core of their actions." David Beasley, executive director of the U.N.'s food program, said "certain elements of the Houthis" are denying the agency access to some parts of rebel territory — and appear to be diverting food aid. "It's a disgrace, criminal, it's wrong, and it needs to end," Beasley said in an interview Sunday with the AP. "Innocent people are suffering." 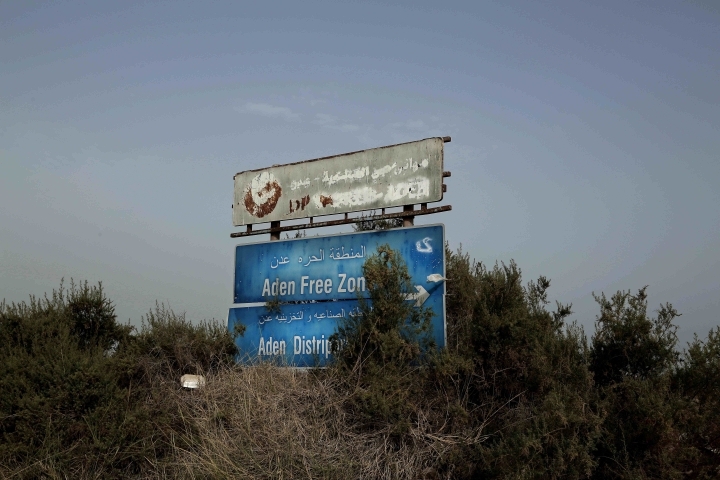 The rebels and the coalition forces have begun peace talks in recent weeks, a process that has led to a reduction in fighting and eased the challenges of getting food aid into and out of Hodeida, the port city that is a gateway to the Houthi-controlled north. But even if donors are able to get more food in, the problem of what happens to food aid once it makes landfall remains. The war in Yemen began in March 2015 after Houthi rebels swept out of the mountains and occupied northern Yemen, forcing the government of Yemeni President Abed Rabbo Mansour Hadi into exile. After the rebels began pushing farther south, Saudi Arabia and other Persian Gulf states formed a coalition to take on the Houthis, describing their involvement as an effort to stop Iran, which has ties to the Houthis, from gaining sway over Yemen. The coalition launched a rolling campaign of airstrikes and imposed an air, land and sea embargo on the rebel-held north. The Houthis, in turn, have blocked a key access route to Taiz, making it difficult for aid groups to get food and other supplies into the city. The Houthis, a Zaidi-Shiite religious movement turned rebel militia, control an expanse of northern and western Yemen that is home to more than 70 percent of the country's population. In these areas, officials and relief workers say, Houthi rebels have moved aggressively to control the flow of food aid, putting pressure on international relief workers with threats of arrest or exile and setting up checkpoints that demand payments of "customs taxes" as trucks carrying aid try to move across rebel territory. "Since the Houthis came to power, looting has been on a large scale," said Abdullah al-Hamidi, who served as acting education minister in the Houthi-run government in the north before defecting to the coalition side earlier this year. "This is why the poor get nothing. What really arrives to people is very little." 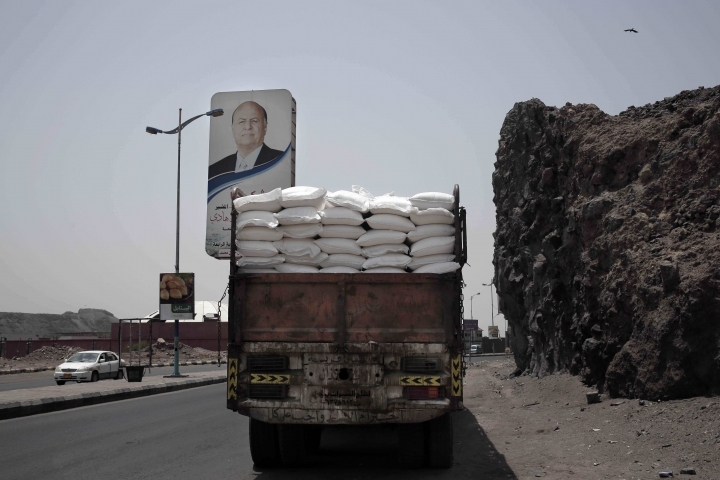 Each month in Sanaa, he said, at least 15,000 food baskets that the education ministry was supposed to provide to hungry families were instead diverted to the black market or used to feed Houthi militiamen serving on the front lines. Half of the food baskets that the U.N. food program provides to Houthi-controlled areas are stored and distributed by the ministry, which is chaired by the brother of the rebels' top leader. 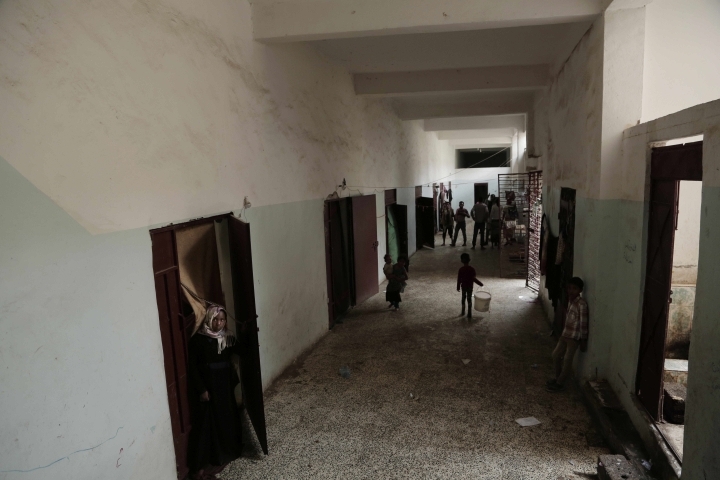 Moain al-Nagri, a managing editor at the Houthi-controlled daily newspaper, al-Thawra, told the AP that the paper learned last week that hundreds of its staffers had been falsely listed for more than a year as receiving food baskets from the education ministry. It's not clear where those food baskets went, he said, but it's clear that few of his employees received them. Three other people with knowledge of relief programs in Houthi territory confirmed that they had knowledge of food baskets being improperly diverted from the education ministry. The three individuals and many others interviewed for this story spoke on condition of anonymity, because of the risks that the rebels might block aid programs or deny visas. A senior U.N. official, speaking on condition of anonymity to discuss the issue, told the AP that enough aid is coming into the country to meet the demands of the hunger crisis, but much of it is stolen. "If there is no corruption," he said, "there is no famine." Throughout Yemen, food that is supposed to be given for free to starving families ends up for sale in markets. The Houthis' ministry of industry has documented hundreds of sacks of World Food Program flour being sold commercially after being repackaged by merchants, according to Abdu Bishr, who previously served as head of the ministry. Bishr, now a member of rebel-controlled parliament, says both sides in the war are to blame for failing to prevent the diversion of food aid. 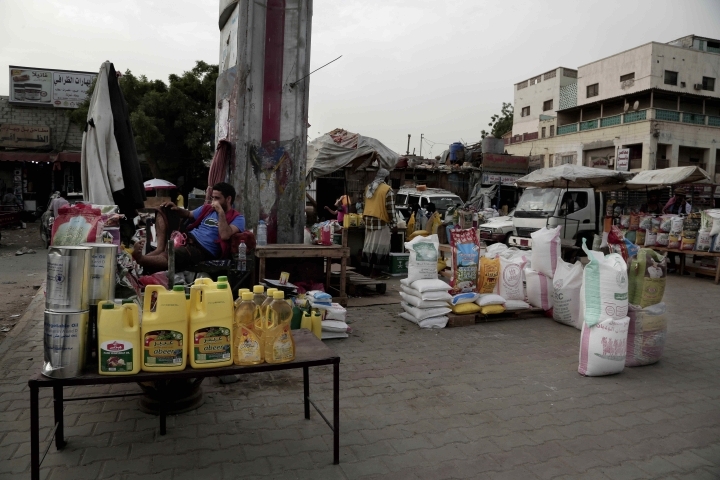 Video shot in 2017 and obtained by the AP shows busy markets in the cities of Taiz and Aden not bothering to repackage pilfered food aid — selling cooking oil and flour displaying the U.N. food program's WFP logo. AP journalists reporting in Yemen this spring and summer spotted other examples of food with the logos of the WFP and other global relief groups being sold in markets in both Houthi and coalition areas. "We have found entire stores packed with U.N. aid," said Fadl Moqbl, head of an independent advocacy group, the Yemeni Association for Consumers' Protection. Because the war has wrecked the country's economy, many Yemenis don't have jobs or enough money to buy food in stores. Al-Hakimi, who worked for much of this year as the executive manager of the coalition-backed government's local relief committee in Taiz, said Yemenis will need more than short-term handouts. They need help to rebuild the country's economy and create jobs that will allow families to buy their own food. When officials in Taiz asked al-Hakimi to take over as the relief committee's manager, he hoped he could help turn around the hunger crisis that has been building in the city since the war began. He soon discovered the scale of challenges facing him. Political power in Taiz is divided among militias that have been folded into Yemen's national armed forces but continue to compete with each other to maintain their grips on the sectors of the city they control. "Here the only means to achieve anyone's goals is through weapons," he said. "Who gets on the beneficiaries' lists? Those who have weapons. The poor, the most miserable, and the weak can't get their names on the lists of beneficiaries, so the aid goes to the powerful." Coalition bombing campaigns and guerrilla fighting on the ground have demolished homes, factories, water works and power plants and killed more than 60,000 combatants and civilians. More than 3 million people have been displaced, increasing the demand for food and other help from outside the country. 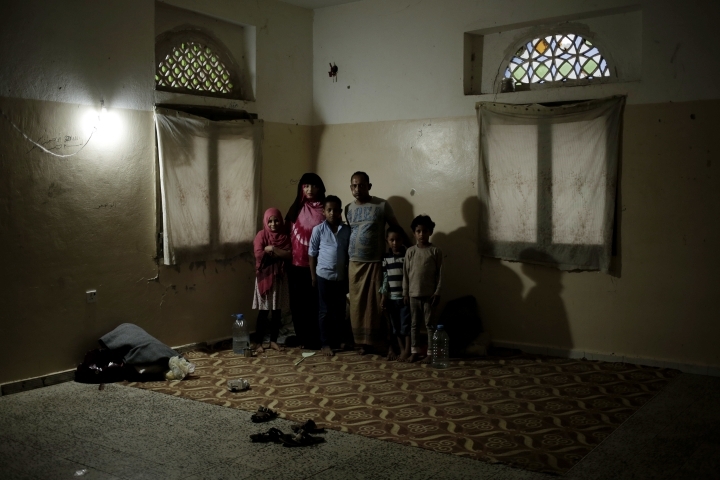 In a 2017 survey funded by the European Union, two-thirds of displaced Yemenis who responded said they hadn't received any humanitarian aid, even though people forced from their homes are supposed to be key targets of U.N. relief efforts. 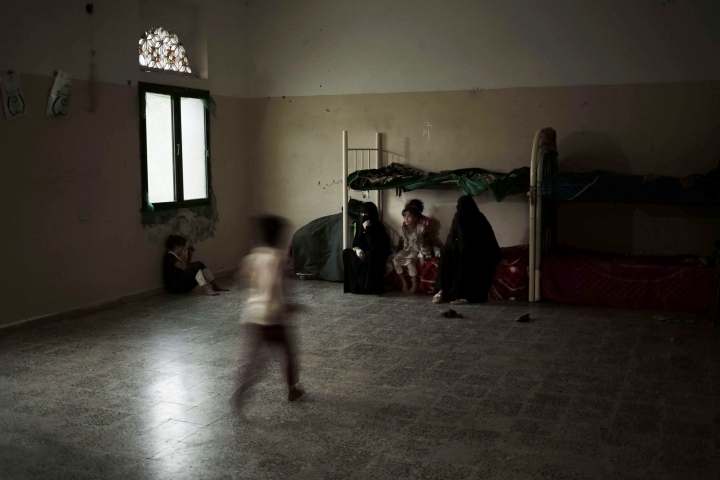 In displacement camps in the Houthi-controlled northern district of Aslam, barefoot children and mothers whose bodies have been reduced to skin and bone live in tents and huts made of sticks and sackcloth. The camps are not far from villages where the AP reported in September that families were trying to stave off famine by eating boiled tree leaves. The U.N. and other global aid organizations estimate that 1.5 million Yemeni children are malnourished, including 400,000 to 500,000 who suffer life-threatening "severe acute malnutrition." One-year-old Nasser Hafez, who lived with his family in a camp called al-Motayhara, died Dec.12 from malnutrition and other complications at a hospital run by Doctors Without Borders. He was in a coma for five days before his tiny body gave up. His father and 16 members of his family have moved at least six times since the start of the war. Before, the father said, he had been a tailor, earning enough to feed his family meat, chicken and vegetables. He said he hasn't received a single food basket from the U.N.'s World Food Program. "They register us every month, maybe up to five times, but we never get food," he said. He said the family has gotten cash transfers every few months equal to $50 from the relief group Oxfam. It costs almost half that amount, he said, to buy 50 kilograms of World Food Program wheat from a market, which lasts his family only a week or two. The Houthi rebels maintain tight control on how much food goes to which districts and who gets it. 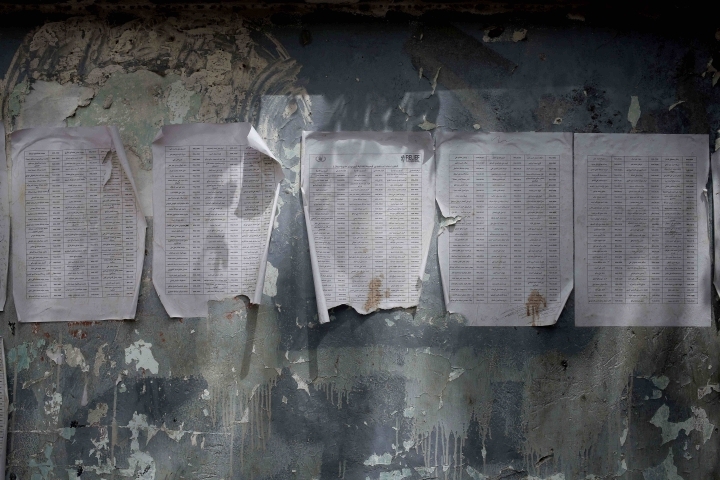 They manipulate the official lists of beneficiaries by giving preferential treatment to Houthi supporters and families of slain and wounded soldiers, according to relief workers and officials. "Some areas in Yemen take the lion's share and other areas receive a trickle," said Bishr, the member of the Houthi-controlled parliament. Five relief workers told the AP that they believe the U.N. and other international groups have been forced to sacrifice their independence in order to maintain access as they try to deliver aid to as many people as possible. The Houthis "threaten decision-makers and international employees through permits and visa renewals," a senior aid official told the AP. "Those who don't comply will have their visas rejected." He said that he discovered his employees were tipping off the Houthis about the contents of his conversations and emails. When he complained about the spying, he said, the rebels pulled his visa and forced him to leave the country. Beasley, the top official at the U.N. food program, said he believes some of the rebels in key positions do care about the welfare of struggling families and have worked well with his agency, but there are others "who don't care about the people." "Anytime you are in a war zone, it's a difficult situation and obviously when it comes to the United Nations we are neutral," he said. But when it comes to making sure that food aid gets to the people who need it, "we can't be neutral. We need to speak out in strongest voice, condemn it in every way." Even before al-Hakimi took over as manager of Taiz's relief committee, officials and activists complained about intrigues and outrages relating to donated food. In September 2017, the relief committee sent a warning to the King Salman Humanitarian Aid and Relief Center, a charity run by the Saudi government and one of the key donors in Yemen. The letter said many of the 871,000 food baskets that the King Salman Center claims it has provided to Taiz and surrounding areas had been "lost and unaccounted for." It said local groups that were supposed distribute the food were refusing to answer questions from the committee, apparently because they wanted to make sure "the truth never comes out" about where the food goes. In the spring of 2018, the government in Taiz turned to al-Hakimi, who holds a doctorate in strategic development planning and has years of experience in training aid workers. Three relief workers in Taiz told the AP that al-Hakimi is known for being a principled person who won't go along with corrupt deals. He took the job after providing the committee a list of 14 conditions aimed at addressing the flaws in the aid distribution system, including a requirement that the committee approve and coordinate all aid deliveries in Taiz. 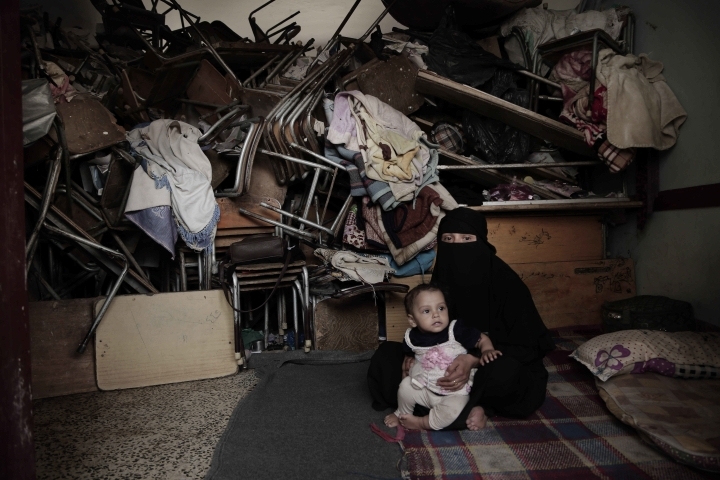 One problem al-Hakimi and other relief workers faced was the Houthis' partial blockade of the city. The Houthis — who had taken over Taiz in the spring of 2015 but were pushed out by coalition forces in late 2016 — still control a key highway leading into the city. This slows the transport of aid into the city and limits how much can get in. Despite the challenges, he won some victories after he started his new job. In one instance, he reached out to a military commander and secured the return of 110 sacks of flour that had been snatched from trucks in the highlands north of the city. But in most cases, once the aid was gone, it was gone for good. 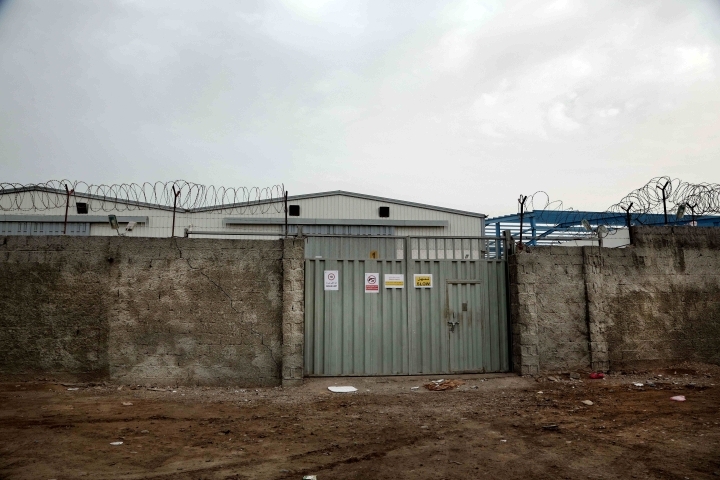 In early June, al-Hakimi and a local official demanded, to no avail, that an army unit known as Brigade 17 return 705 food baskets that had been lifted from a warehouse — as well as the "personal weapon" of the guard who had been trying to protect the goods. "I talked to everyone but there was no action," al-Hakimi said. "The commander acted as if he wasn't in charge." Brig. Gen. Abdel-Rahman al-Shamsani, the commander of Brigade 17, denies that his unit took the food baskets. He told the AP that recipients who had grown tired of waiting had "raided" the warehouse and taken food that was intended for them anyway. As problems piled up, al-Hakimi aimed a flurry of complaints at bureaucrats and military officers. In a letter to a top army commander and an internal security chief, he wrote: "This is about your negligence in failing to take the necessary measures to bring back looted World Food Program aid." If they did not quickly arrest the culprits and bring back the stolen items within 24 hours, he said, he would hold them "fully responsible for depriving Taiz of aid" and for "any humanitarian disaster in Taiz" that followed. There was no response, al-Hakimi said. By September he'd had enough. "It's very important to do this work — but also important to have the power and authority to do it," al-Hakimi told the AP. He tried to resign, but a top city leader talked him out of it, promising that officials would address the problems. Nothing changed, al-Hakimi said. So in October he quit for good. Two months later, an analysis from the U.N. and its aid partners estimated that 57 percent of Taiz's residents face emergency- or crisis-level food insecurity. The group's year-end breakdown says as many as 10,500 people in and around Taiz are living and dying in areas overtaken by full-blown famine.